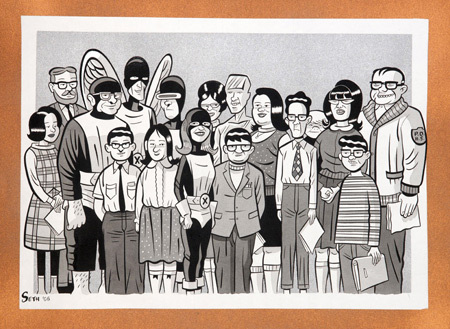 Old news, I know, but I really dig this picture of the X-Men by Canadian indie comicist Seth. If you haven’t read his graphic novel It’s a Good Life if You Don’t Weaken, you’re missing out on one of the best bits of Can-lit I’ve read lately. So I’ve been pretty focused and Interweb-less the past couple of weeks. I have some deadlines looming, a couple of recently-scrapped projects behind me, and various other demands of my time. Yesterday, after a morning full of meetings, I spent about ten hours straight trying unsuccessfully to implement an optimization algorithm. I walked home, tired and frustrated, in full-on zombie mode. And Ty, Gill and I watched this video of bouncing Japanese kids playing the Saber Dance. About three times in a row.